If you’re a developer already experienced with programming for the GNU/Linux system, are experienced with another UNIX-like system and are interested in developing GNU/Linux software, or want to make the transition for a non-UNIX environment and are already familiar with the general principles of writing good software, this book is for you. In addition, you will find that this book is equally applicable to C and C++ programming. Even those progamming in other languages will find this book useful since the C language APIs and conventions are the lingua franca of GNU/Linux. Download the full text of the book as PDF files . The book is published under the Open Publication License, Version 1.0. Please consult the OPL for conditions on redistributing or modifying the book. The code samples in this book are covered by version 2 of the GNU General Public License. Please consult the GPL for conditions on using, modifying, and redistributing the code in this book. You may also browse the code listings on-line. Here are some places to visit on the Internet to learn more about programming for the GNU/Linux system. The 2007.01 release of Software for Starving Students is now available for download at Softwarefor.org. 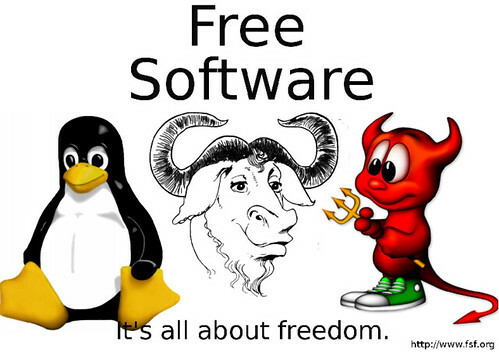 This list provides you access to high quality software, free of charge. These guys, even if something on the list is not open source/free, have permission to distribute it via their compilation CD. Microsoft released a new and more powerful command line shell and task based scripting technology called Windows PowerShell today. Powershell brings in Unix style shell scripting to Windows Vista as well as Windows XP and Windows 2003 platforms. You can use it to unleash the power of wildcards and working objects too. Say you wanted to get all the services that start with “a” and then get all the dependent services associated with it, simply typing “PS> get-service w* | format-list DisplayName, DependentServices” should do the job. History: Before being released as Windows Powershell, it was previously known as Windows “Monad” Shell and MSH or Microsoft Command Shell. 4. Can configure the much hated User Account Control (set-itemproperty -path HKLM:\SOFTWARE\MICROSOFT\WINDOWS\CurrentVersion\Policies\System -name ConsentPromptBehaviorAdmin -value 0) where a 0 will turn of UAC and 2 will turn it back on. It’s not an easy task to find a vulnerable service and find an exploit for it. It’s also not easy to defend against users who might want to exploit your system, if you are a system administrator. However, writing an exploit by yourself, to convert a news line from bug tracker into a working lockpick, is much more difficult. This article is not a guide on writing exploits, nor an overview of popular vulnerabilities. This is a step-by-step guide on developing a shellcode, a crucial point of any exploit software. Hopefully, learning how they work will help conscientious and respectable developers and system administrators to understand how malefactors think and to defend their systems against them. Every IT professional worth his/her salt has their own webpage/blog these days. While you may have people from all over the globe dropping a line at your site, Email harvesters are the most unwanted visitors on any website. These email spambots crawl the web via search engines to find and extract email addresses from webpages. E-mail addresses in your blog or webpage are no secret to spam robots. Here’s a guide that should help you protect your email addresses from these spam spiders. Techniques mentioned use text manipulation, Masking, HTML, Flash, CSS, and JS to hide email addresses. How email spammers operate? Email addresses always contain an @ symbol. Most spambots do a pattern-search for likely combinations of letters ([email protected]) like [email protected] or [email protected] in the HTML source of webpages. Often they just search for the @ character and grab all the letters on each side on the assumption that it’s a valid email address.